This is sort of like a straight jacket made out of a tarp and a belt. I wonder how long this would last—but it’s still a classic MacGyver hack. This blog would probably be better if I included pictures. Oh well. A space blanket is basically a thin mylar sheet. It has a nice property in that it reflects infrared radiation. The idea is that you cover yourself with this and when your body radiates infrared light, it reflects it back to your body. Can you use this as a countermeasure against a ground to air missile? Maybe. Of course there are two types of missiles. There is the heat seeking missile and the radar missile. For the heat seeking missile, it is guiding by the giant infrared source—the engine of the aircraft. It’s a least plausible that this space blanket could block the infrared light from the helicopter enough to confuse the missile. Possible. If the missile is radar guided, then you can block the radar that comes out of the missile. This is the idea behind chaff (a real thing). It’s basically thin strips of metal that fall in the air behind an aircraft. The metal spreads out and can make a large radar reflection such that the missile thinks it’s a target. Would a space blanket work? It’s possible. Really, you want metal—but this might work at least a little bit. Classic MacGyver stuff here. Nothing else to say. Can you get clean water from a tree? It seems like this is legitimate. This seems like a plausible way to dry out a wet phone. It would take some time though. MacGyver uses the blade on his knife to attempt to reflect sunlight towards a rescue helicopter. I’m pretty sure this would work. As a side note—I’ve been thinking about the brightness of light reflected from a mirror (for another project). It seems like this is fairly difficult to calculate. Perhaps the best way is to just experimentally measure the brightness of reflected light. I guess I will do that at some point. If you want to use a battery to start a fire, you need an electrical conductor. This allows electric current to flow from one terminal of the battery to the other. It’s this electrical current that can make things get hot—hot enough to catch on fire. So, the battery part is good. What about the tree sap? Yes—apparently, it is indeed a conductor. There you go, a fire. This is another reminder. I should write a post about how to estimate the distance to a storm. The short answer is that when lightning strikes it produces both light and sound. The light has a super high speed, but the sound is just fast (not super high fast). This means that the light gets to the observer first. By counting the time between the “flash” and the “boom” you can estimate the distance. I thought I had already blogged about this—but I can’t find any such post. 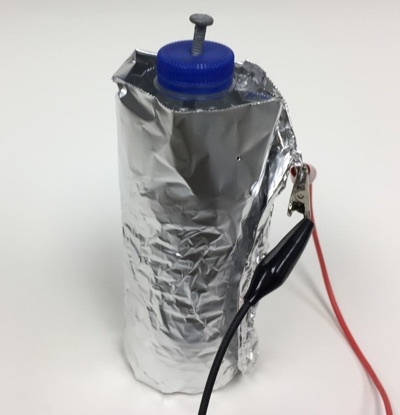 Here is the short version: MacGyver makes a DIY electrical capacitor (a Leyden jar) to get some electrical charge from a lightning storm. He then uses this to power the satellite phone. The Leyden jar is totally real. Honestly, I was surprised at how well this worked. Check it out. Also, I have a much longer blog post over at WIRED. Finally, you can make something like this yourself. MacGyver uses the zipper to make a complete circuit from the battery to the sat phone. Would this work? It’s tough to say. In order to get an electric current, you need a closed circuit with a conductor the around the whole path. Parts of a zipper are clearly conductors (the metal parts). However, if there are gaps between the metal, then it wouldn’t work. If you zip the zipper, there should be contact—at the very least, this is plausible.